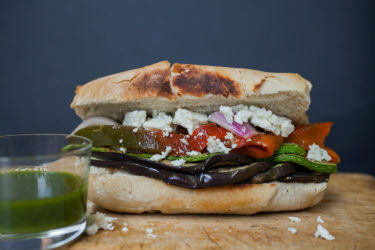 This delicious Chile ancho and braised steak sandwich is not just your average sandwich! What’s not to love about a steak sandwich? Well, unless you don’t eat meat, but that’s a whole different story! 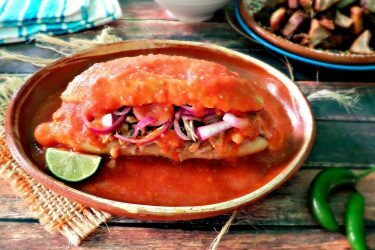 There is just something about a Mexican bolillo roll, toasted and filled with steaming, hot beef; whether it’s grilled carne asada, steak braised in a sauce, or tender beef barbacoa. 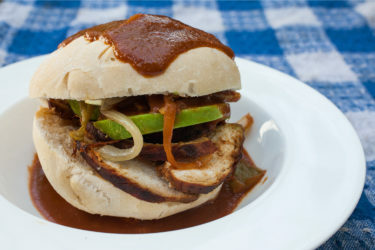 The toppings ranged from melted cheese to freshly made salsas, tomato slices, avocado, cilantro, and onion… yum! Those were some of the best meals I ever had at home! I am always telling my friends how I like to play with my food; so for this recipe, I topped it with a chimichurri sauce, which I just learned to make this past year. I am enjoying everything about my summer garden with all of the fresh herbs. Roughly chop the tomatoes, onion, and garlic; transfer to the blender. Drain the liquid from the chile ancho and add it to the blender, along with the cumin, bouillon, water, 1 teaspoon of salt, and ½ teaspoon pepper. Blend on high until smooth, taste for salt and set aside. In a large skillet, add 3 tablespoons of olive oil and heat to medium/high heat. Season the beef with salt, pepper, and granulated garlic. When oil is hot, add the beef to the skillet and cook, turning as needed, to brown both sides. Add the sauce from the blender, stir well to combine. Lower the heat, cover and continue cooking for 1½ to 2 hours, stirring when needed. You can serve the beef as-is with rice and beans or you can make steak sandwiches. For sandwiches, I like to use bolillo rolls, top beef with thin slices of mozzarella and heat under the broiler just until cheese melts. 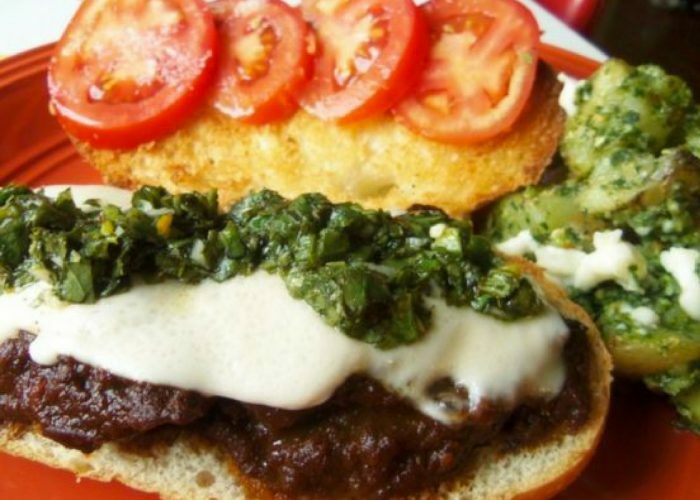 Top with your favorite salsa or chimichurri sauce.